With the accessibility of technology that makes us constantly connected, it is very difficult for me to sign off and not check-in. I am okay with that! Do you work or not when on vacation? Do we even take a “true” vacation? Is “true” vacation even a thing in this day and age? Are you one of those people who can’t unplug? Well — I’ll be the first to raise my hand and say, ”I am that person and I am guilty of working when I’m supposed to be unwinding, relaxing and enjoying a trip that I so looked forward to having”. We all spend a lot of time planning our trips and count the days in anticipation of its arrival. But most of us fail to make the most of it! We are so immersed and connected to our smartphones and tablets, too busy catching up with emails and distracted by social media to be in the moment to enjoy and engage with the surroundings and experience. Instead of basking in the beauty of our destination, we’re busy taking selfies and posting on Instagram. I agree that I should be enjoying my time-off and learn to shut off when away on vacation but with the accessibility of technology that makes us constantly connected, it is very difficult for me to sign off and not check-in. Surveys report that most than half of employees check email while they are on vacation. I remember the time when I vowed not to do any work while we were in Hawaii. I managed to really enjoy my vacation and although I was tempted to check my emails, I was proud that I was able to stay away. On Day 5 of our vacation, I noticed while I was fixing my hair that I had a quarter-sized bald spot on the right side of my head. Panicked and scared, I called my hairdresser who I saw a few weeks before I left for Hawaii and frantically asked her if she noticed the bald spot when she saw me. She told me she didn’t see a spot so I knew the spot showed up in Hawaii. How could this be? I was so relaxed and for the first time I can truly say that I was having a “true” vacation! Why would something like this happen when I’m supposed to be worry-free and enjoying my time-off? As you guessed the rest of my vacation was not as relaxing as it should have been. I still didn’t check in at work nor did I do anything that resembled anything close to working but I was so stressed because of the bald spot on my head that I had no idea how it got there. When I got back to Colorado, I saw my doctor who couldn’t really tell me why my hair fell out except that it was probably due to stress. Stress??? I was so relaxed the first five days vacationing in Hawaii. I only started stressing out when the bald spot appeared! My doctor concluded that because my body was so used to me constantly working that it felt stressed when I felt relaxed from not doing any work for five days. This harrowing experience made me decide to go back to working when vacationing — — – I love my hair and I wouldn’t want to go bald! I however, want to have and enjoy amazing vacations so I have learned to do few things to ensure that I have a wonderful vacation even if I have to spend a few hours working. You may think this won’t make a difference but it does! When people know when you’re not available, they know not to expect a response from you. This gives you some time to reply back to their message. Be specific as to when your departure and return dates are. If there is someone who is helping out while you’re away, make sure to include that person’s information on your out of office message so people contacting you know an alternate person they can reach out to help them while you’re gone. This is the one thing I make sure I follow and do. For most of us it is very difficult to give up the reins. Being able to delegate and trust that someone can help check off your to do list will really help to complete tasks and make you more effective in producing results. 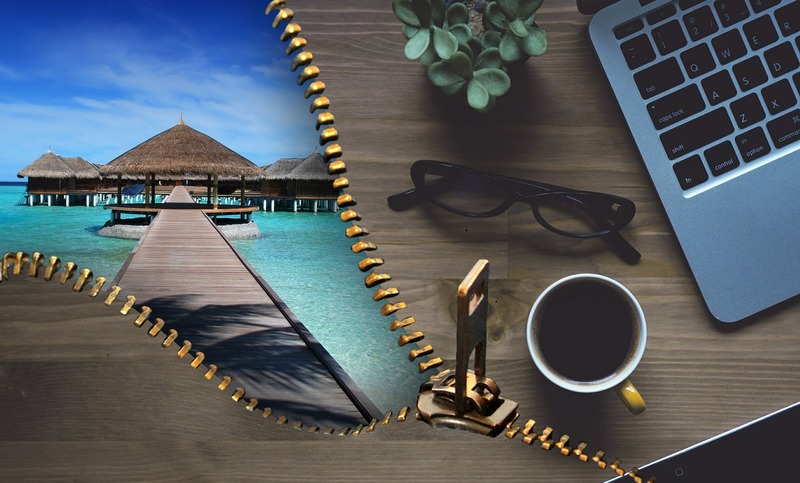 When you’re away, delegating is crucial if you want to return knowing you won’t find work piled up that can make you so stressed you need another vacation! Do you ever find yourself working long and hard before your vacation? There always seem to be never ending work the day before you leave. While it might be tempting to cut off work early to run errands, get things ready for your trip or start packing — — you’ll thank yourself later for putting the extra hours at the office before your vacation. Finish your projects, make sure your co-workers know what to do while you’re out and establish the ground rules for contacting you on vacation. If you already decide to check emails while you’re away then plan to schedule a time during the day for this. Depending on the time zone difference, I would schedule to check and respond to my emails either first thing in the morning before we do activities or at the end of the day when I get back to the hotel. Your out of office message should tell people when you plan to respond to emails so they don’t expect to hear from you right away. This works pretty well for me unless I have a time sensitive project that I know would need my immediate attention then I end up checking my messages during the day outside my planned scheduled check times. Although I have scheduled times when I respond to emails, I may skim and look through my inbox quickly during downtimes. I usually delete all the junk emails and flag those that I can deal with when I get back to the office. The ones that are left in my inbox that are not flagged will be worked on and responded during my scheduled time to respond. If I know that I am traveling to a location that may have spotty internet access or if I am on a trip that I know is important and one that deserves my focus, then I’ll let everyone know that I may not be able to respond or get back to them while I am away. This is a good time to delegate certain tasks to someone who can respond and work on a certain project or task when you are not able to. If you decide to actually not work when on vacation, don’t feel guilty! Do what is best for you and get that perfect balance. I actually enjoy myself more when I stay connected and know that everything is running smoothly at work. Not only do I know that working while I’m away will make sure I don’t go through the experience of once again losing my hair, it also makes me feel better knowing that I’ve taken care of things when I could and know that I will not be coming back to a ton of unfinished work. However, if you need to have downtime from work and completely disconnect from the office when on vacation — — then go for it! Do not feel any guilt. Just make sure that you set expectations so your supervisor and people in your team know that you will be out of touch the whole time. Linnore Gonzales is the creator of Living Good by Design, a lifestyle and travel blog. In addition to creating the Living Good by Design blog, Linnore owns D&Y Design Group, an interior design and remodeling company. She also started and grew various businesses including a long-term part time staffing company, a women's boutique, a woman's magazine and also hosted a local radio program and a lifstyle television show. Linnore loves business but also enjoys traveling, food, fashion and the good life. She will be sharing her love of these things on her Good Living by Design blog.